The Institute of Public Health – ACG and the “George D. Behrakis RESEARCH LAB” of the Hellenic Cancer Society were actively involved in the organization. The opening ceremony took place at the Zappeion Megaron. H.E the President of Democracy declared the Conference open and soon after Professor Emeritus Theodosios Tassios, delivered a thought provoking speech on “The passion of Socrates for Ethos”. Μore than 300 International participants attended the three days of the conference, that included a rich scientific program, warm hospitality and social events that took place in venues of great historical and cultural significance. in Athens. During the conference, the book “Tobacco Cessation Guidelines for High–Risk Populations” was presented and distributed to the participants. It is the biggest epidemic of all time. To tackle the problem, the Global Community has created the Framework Convention on Tobacco Control (FCTC), the largest global Treaty of WHO. In addition, the European Union has adopted two clear and strict directives regulating tobacco products licensing and use (Tobacco Products Directives I and II). However, the solution to the problem remains challenging as we confront a severe addiction. Nicotine, the main ingredient of tobacco products, is considered to be the third most addictive substance after heroin and cocaine. Complex and not fully elucidated destructive neurobiological and behavioral mechanisms compose the personality of the typical addicted smoker who desires but fails to quit. The medical practice of smoking cessation requires specialized knowledge. Almost all organizations dealing with tobacco control have issued relevant guidelines. Quite distinctively, the European Network for Smoking and Tobacco Prevention has issued first and second editions of a general cessation guideline readily available in many European languages. Generalization and simplicity are imperative for success in preventive medicine. However, medical science of the twenty-first century is systematically moving toward more individualized therapeutic approaches. In other words, “One key cannot open all doors”. 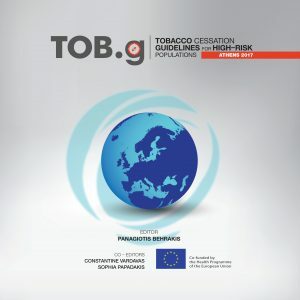 The “TOB.g project” and ultimately this book represent the first innovative action towards the scientific application of this principle in tobacco cessation. Aim of the project is to provide an individualized approach to smoking cessation within five clearly distinctive subpopulations of smokers, who obviously cannot continue to be treated as a single entity. Teenagers, cardiovascular patients, pregnant women, patients with diabetes or chronic obstructive pulmonary disease belong to clearly distinct groups and reasonably require a tailored approach to treatment. The course to successful cessation is a long and arduous one. This book represents the first step toward a new consideration, a new direction and a new path, leading to a more efficient approach to a major Public Health concern. The entire project has evolved from the general scopes of the ENSP and in accordance with Article 14 of the FCTC.